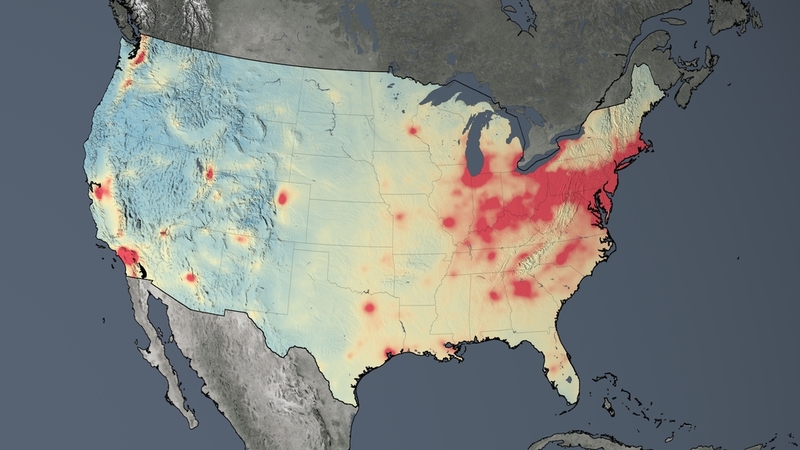 #AGU15 New NASA satellite maps show humans have less of a fingerprint on global air quality compared to 10 years ago | Watts Up With That? 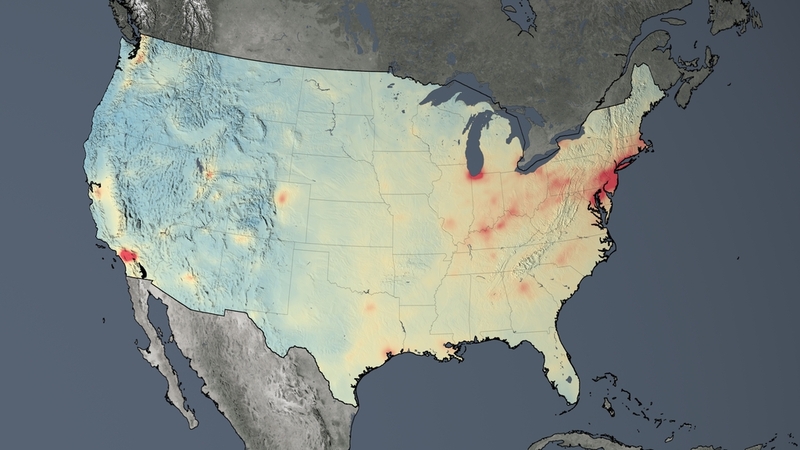 December 15, 2015 in AGU 2015, Air pollution. 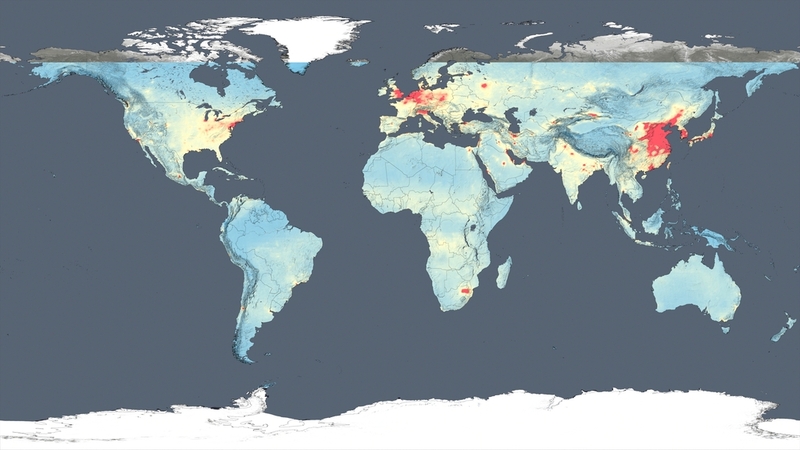 Then per the citation, “American and Europe have the highest [nitrogen dioxide]”, and looking at the dâmned maps, I’d say one needs to be BLIND to miss that almost all of Northern China is RED. Moreover, the detailed maps of America at least show a huge reduction in RED. What is this report talking about? That isn’t in the article. It is unclear to me how they can account for different weather conditions and their effects on the readings. Point samples of the same date will most likely have different weatherconditions. Shocker!! There seems to be no problem in Alberta, Canada. 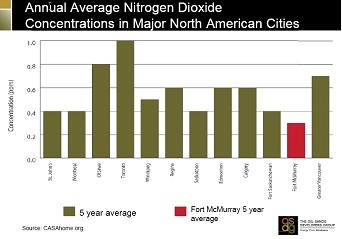 The issue is CO2 emissions associated with oil sands. Not really. The post is about pollution. The NASA article is about NOx, not CO2. As I intially posted, no problem in Alberta, Canada. Geez Loise. The only one who mentioned Co2 is you, buddy. The Japanese ‘foot print’ is lessened also. Would someone tell the Federal law breakers at EPA about this. Where is the pollution from the massive coal powered power station at Four Corners (NM, CO, AZ & UT)? It’s there. The plant is located in New Mexico, in the lower right quadrant of the four corners but close to the intersection. Only two of the five units remain operational, and that’s likely to explain nearly all the decline in NOx emissions. And why are they plotting “pollution”? These maps look nothing like the ones with CO2? Are they trying to blame man? The improvement is attributed to government regulation. Of course WUWT would not include that. On the contrary, the featured text makes the link between govt. regulation and decreased pollution very clear. CO2 is not pollution by the way, but an historically scarce wonder gas that we should make every effort to increase. So why did the plant life of the earth not all die out over the past 800,000 years when CO2 fluctuated between 180 and 300 ppm. 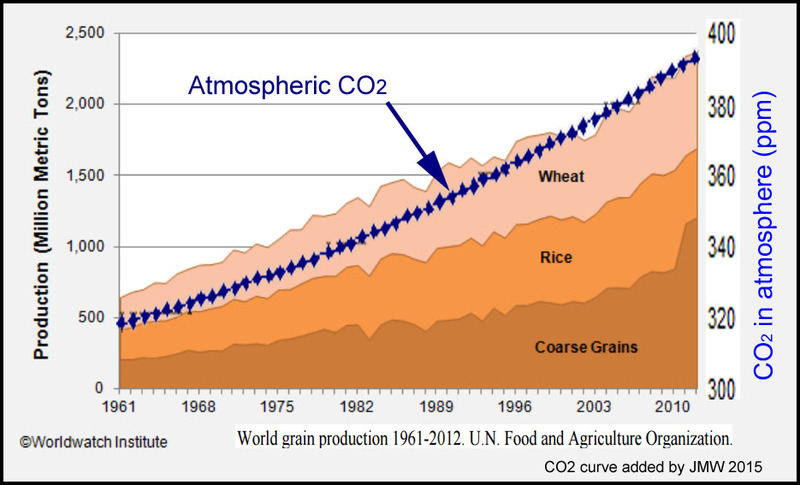 Increased CO2 is harmful to our food crops which evolved and were domesticated in an atmosphere that never exceeded 300 ppm. Extra CO2 just produces extra stalks and leaves; not fruits, grains, etc..
Jack, if you actually believe that “Extra CO2 just produces extra stalks and leaves; not fruits…”, then the rest of us are conversing with a know-nothing. Your preposterous and completely false assertion presumes that thousands of farmers inject CO2 into their greenhouses at extra cost, in order to produce worthless plant matter instead of valuable products. This is a science site; the internet’s “Best Science” site. After your comment above, it’s clear you’re in the wrong place. A science fiction blog, or maybe a religious blog is where you should be commenting. I see you are member of the carbon cult. The studies that I have cited are peer-reviewed science. …oh, ‘scuse me, I forgot I was replying to a know-nothing. What you really meant was CO2, a compound, not carbon, an element. FYI, CO2 is as essential to life on earth as H2O (that’s water, which you probably didn’t know either). So yes, I’m a carbon cultist. I prefer life to the alternative. I suspect you do too, therefore your comment is simple projection. Right you are. Mea Culpa. I will stick with peer-reviewed plant science. Ah, that familiar refrain. I’ll not examine the data or facts, I’ll just stick my nose in the air and dismiss it out of hand because it doesn’t appear in the publication of my choice. Were you to keep your nose stuck in the air, and stick to your word, you’d have no car to drive, no airlines to travel with, no recorded music to listen to nor an entertainment system to listen to it on…. all these things starts out as fledgling science and none in “peer review”. well… yes – just a shame they can’t get their act together with OCO-2 eh? The problem now looks like it is centered on EPA headquarters and Brussels. I hope you’re not suggesting officials got deals on nice cars because they kept it under their hats for a couple of years? What part of “open environments” do you not understand? Do you propose to dome all arable land? The Heartland funded Isdo family web site has a history of misrepresenting research, which may explain why they do not provide URLs to the original research. which may explain why they do not provide URLs to the original research. Now about those greenhouse operators…. But yet the Idsos retain the webpage, even after the author protestations. BTW – neither of the articles on that page have a URL or a DOI. Chen, N., Gan, Y. and Wang, G. 2003. Photosynthetic responses of muskmelon (Cucumis melo L.) to photo flux density, leaf temperature and CO2 concentration. Canadian Journal of Plant Science 83: 393-399. Mavrogianopoulos, G.N., Spanakis, J. and Tsikalas, P. 1999. Effect of carbon dioxide enrichment and salinity on photosynthesis and yield in melon. Scientia Horticulturae 79: 51-63. Jack Dale, I want to thank you. Itz people like you, who show up making all sorts of absurd claims which are to easily refuted that they reaffirm my position as a skeptic. If your side had all the facts, all the “settled science”, all the proof on your side, you wouldn’t have to resort to deceptive tactics to make your case. I cannot be bothered to argue with you further, I’ve lost count of the people like you who show up spouting dogma, can’t defend it, and eventually disappear. I’m waiting for one, just ONE to show up with facts, logic, and reason that give me any concern at all. I’m going down to the local pet store to get a CO2 bubbler for my aquarium. You would be gob smacked at how much better the plants grow. That’s why you can buy the gear off the shelf. Works wonders. Just like it does in commercial greenhouses. Just show me one. Is that too much to ask? Be careful with that CO2 bubbler. CO2 levels in excess of 25-30 ppm are dangerous for fish. Common signs for CO2 poisoning are an increasing and more rapid breathing, gasping for air, and a staggering swimming behavior – all leading to suffocation of the fish. CO2 levels in excess of 25-30 ppm are dangerous for fish. Too little water in your diet is fatal. Too much water in your diet is fatal. Your point is just as irrelevant to the discussion as is that. Which doesn’t change the fact that the plants grow like crazy when you increase CO2. In the water, in the greenhouses, a point which you keep ignoring. I have not questioned the efficacy of CO2 enhancement in greenhouses. I do not question what you do in your aquarium; i do not care. I do question and care about what we do in our atmosphere. You have not shown one single URL from co2science to original research. Nada, Zilch. I have not questioned the efficacy of CO2 enhancement in greenhouses. I do not question what you do in your aquarium; i do not care. So… you want to make assertions and then dismiss out of hand contrary evidence. Excellent. Oh yes I did. You asked for a url from CO2 Science to original research and that’s what you got. The URL goes to a page on which is meticulously recorded the journal name, volume, and exact pages that each study appears. You demand a click through to the article itself, and argue that such not existing puts the data into question. LOL. You can argue about lack of URL’s all you want, the point is that the articles exist in the very peer reviewed literature you demanded to see. In the hundreds (thousands?) of entries in this database, I’m certain that there’s a transcription error here or there, and older journals that simply were never put on line and other excuses that I am sure you will find. I’m gonna go have me a steaming plate of greenhouse grown, CO2 enhanced broccoli. It is standard academic practice. Quote mining and misrepresentation are intellectually dishonest. You have joined the carbon cult. Quote mining and misrepresentation are intellectually dishonest. I should not have brought my plate back to my desk. Pepsi up through the nose, spattered my keyboard. That was a good one. Your broccoli article does not confirm your belief that CO2 is beneficial. CO2 science simply lists it. Thanks for demonstrating that you don’t give a d*amn about the science, you just want to argue the minutia of how it is referenced. How sad. I showed you that the Idsos misrepresent original research. They are deficient because they are trying to get their zinc and iron from plant sources, even without that a 10% reduction as the study claims isn’t going to kill anyone. The cure is to feed them meat instead with all the extra plant matter lying around we can raise plenty o’ cows and sheep.Use targeted grazing to push the deserts back (yes it turns out that large herds are great for the planet). Hell, you could probably send them enough cows to fix the problem with the money that was spent for that whole Paris fiasco. The cure is to feed them meat instead with all the extra plant matter lying around we can raise plenty o’ cows and sheep. That is a very nice chart, it is an effective use of graphics. But why would anybody have bothered? CO2 has not been shown to have any environmental effect on anything other than an increase in primary plant productivity. Oh, now you’ve done it. Now I have an urge for a nice lamb vindaloo. At least there is a good Indian restaurant nearby. The reason we have little methane in the environment is millions of years back, methane gobbling microbes evolved to plunder this resource. In fact these little guys lie in wait across the globe, in the rocks beneath our feet at great depth.. anywhere methane may occur – and they break it down rapidly to CO2 – which the plants then gobble up. All life is a process of bioaccumulation, we accumulate and concentrate calcium, just as plants generally concentrate carbon and more specifically, broccoli is known to concentrate iron, garlic concentrates selenium, Spinifex sp. gold and water hyacinth concentrates chromium, mercury, cadmium and a bunch of other heavy metals (and quite rapidly too!) – but water hyacinth is unusual – most plants accumulate these things more slowly unless the metal is in abundance .. so faster growing plants due to heightened CO2 levels – which are also drawing less water – are coming to harvestable size quicker without accumulating as much. Nitrogen dioxide emission solved. Start yet another civil war in the mid-east. If ‘O’ can’t get it started in the US maybe ‘H’ can. No use talking to Jack. He has read the warmest handbook and uses all of the prescribed talking points to a tee. He spouts them off on the Calgary Herald comments site daily. Pure drivel. Jack@ss seems to think that CO2 in a green house is different from the CO2 in the atmosphere !! Wonder what magical instrument he uses…..maybe Fairy Dust ?? Thanks, Anthony, this is good news! Less nitrogen dioxide, more CO2. Plants like it too, and we like them. Gee….I didn’t see the killing pollution from all those VW diesels in that data. How come? Why greenhouse operators pump CO2 into their greenhouses? Why the NDVI satellite maps are showing Earth greening? Why most of our food (apart from corn / maize, a C4 plant) comes from C3 plants? I try to suspend judgement when only one or two scientific papers support counter-intuitive hypotheses. Hard to do when papers support subjective biases, but essential for progress in science. CO2 in greenhouse houses enhances growth. Not denied. Foliage (leaves and stalks) is increasing. Food crop increases are closely correlate with increased use of fertilizer, pesticides and irrigation. Could you address the point that a dearth of CO2 was associated with the evolution of C4 plants and that (apart from corn / maize) most of our food plants are C3 plants? This seems to be your assertion and requires your evidence. Did you read the Harvard link provided? “The results showed a significant decrease in the concentrations of zinc, iron, and protein in C3 grains. For example, zinc, iron, and protein concentrations in wheat grains grown at the FACE sites were reduced by 9.3%, 5.1%, and 6.3% respectively, compared with wheat grown at ambient CO2. Zinc and iron were also significantly reduced in legumes; protein was not. There are also peer reviewed publications and satellite measurements showing that the rise in CO2 is greening the biosphere. There is really no credible scientist contradicting that fact. If you ever really thought about it, you would see that putting a seedling in a pot of soil allows it to grow. But it isn’t the dirt that provides growth. The plant’s growth is due to CO2 in the air. As the plant grows, the soil is not depleted. It remains at the same level in the pot no matter how big the plant gets. All the plant’s cellulose, starches, sugars, etc., are provided by CO2 taken from the air. 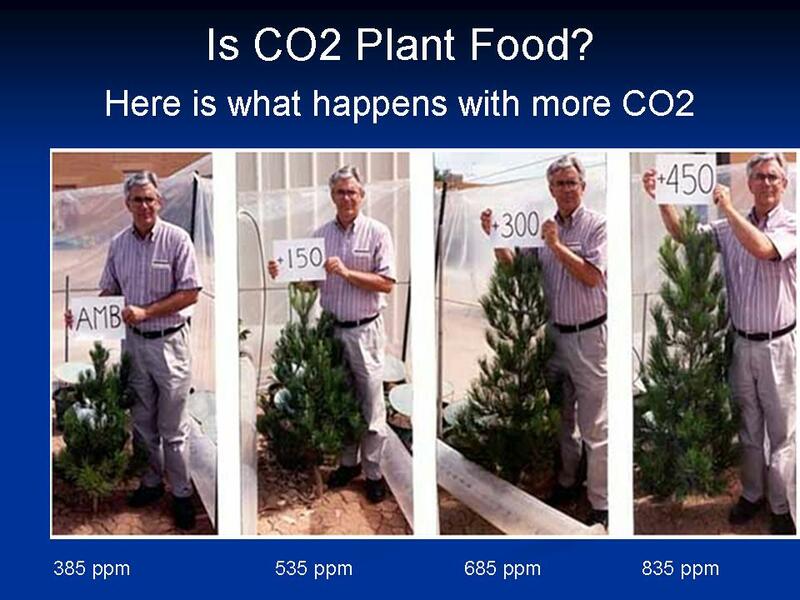 More CO2 results in faster, better, more efficient plant growth. That has been proven empirically so many times that it is accepted as a fact by biologists, chemists, and others in the hard sciences. The reason you do not want to accept that fact is obvious: because if you did, it would debunk your climate alarmism: the rise in CO2 is not a problem at all. Rather, it is entirely beneficial, and completely harmless. More CO2 is better. There is no evidence of any downside at all. A stand-up guy would admit what everyone else knows to be true. Why won’t you? For example, zinc, iron, and protein concentrations in wheat grains grown at the FACE sites were reduced by 9.3%, 5.1%, and 6.3% respectively, compared with wheat grown at ambient CO2. This isn’t new. Bumper crops are always lower in factors such as these, regardless of the root cause of the bumper crop. That’s the bad news. The good news is that you had a bumper crop. For someone starving in some remote part of the world, two bushels of grain with slightly diminished nutrition is way, Way, WAY better than one bushel of grain. H*ll a bushel and a half is better. Double h*ll, a bushel plus 20% is better. I know, I know, I’m not a peer reviewed published scientist, I don’t have a URL handy, just some obvious logic based in your own numbers. I’m sure you’ll reject that since you seem fond of letting others do your thinking for you. reduced water uptake will result in reduced intake of ions – this really is no surprise. Maybe that’s why water hyacinth is such a massive hyperaccumulator of toxic heavy metals – it is designed to really pump the water through it’s system. See above for my comment on bioaccumulation. If plants are observed growing with as much as a 90% reduction in water uptake then it stands to reason they won’t accumulate the higher concentrations of minerals as we see with our our current CO2 levels. Is this a bad thing? Not really.. plants are a good source of sugars and carbohydrates sure – and if we really need to rely on plants for zinc then eating an extra handful of plant matter to make up for the shortfall is no huge effort. When I first read of mineral concentration reductions I paused and wondered why they would present the results the way they did.. and it screams of grasping to meet a political agenda. To be honest, there are benefits to this scenario – I would be happier with reduced selenium, cadmium or uranium concentrations in my vegetables.. I can always eat more garlic if I want more selenium.. not too keen on eating hyperaccumulators of cadmium though. As a trained Plant Scientist, my preliminary take on CO2 augmentation allowing reduced metallic nutrient ion uptake is this: Plant structural etc. carbohydrate production is rendered much easier. Less of the above ions are needed as catalysis-enablers. Same would go for Nitrogen. The soil would be less depleted on a per kg production basis. Agricultural productivity is increasing in lockstep with rising CO2. No rational, thinking person disagrees with the fact that more CO2 is greening the planet. As is often said, correlation is not causation. What is the mechanism? OK, now you owe me for two pepsi’s and two keyboards. Agricultural productivity is increasing in lockstep with rising CO2. Well to be fair db, that statement covers a lot of ground. Irrigation, disease, pest and weed control, advanced seeding and tilling techniques, as well as other factors have increased agricultural production. It is greening of marginal land such as desert edges where human habitation and agriculture are absent, as well as CO2 balance data showing that he biosphere sinking rate is growing (or else the CO2 is going somewhere we never thought to look) that attests to CO2 fertilization. I’m sharing this with you because I know you’ll get it. Don’t get Jack involved in this part, it is way over his head. You drink Pepsi? I thought your beverage of choice would Koch-a-coala. @Jack Dale. Keep talking. Are water and sunshine bad for plants too? I NEED LINKS!!!!!!!! Johnny. I assume from your question that you know nothing about gardening. Really? Do you fertilize your lawn? Lawns grow without fertilizer. They grow by converting atmospheric CO2 to cellulose, sugars, and starches. The give off oxygen molecules, which benefit animals. I explain this for you because you appear to be in the 7th grade, ± 1 grade or so. But I could be mistaken. Maybe you’re a fifth-grader? As you progress in your education you will learn that N, P and K are also necessary for plant growth as are many other substances. But that flew right over your head, and you didn’t even know it. 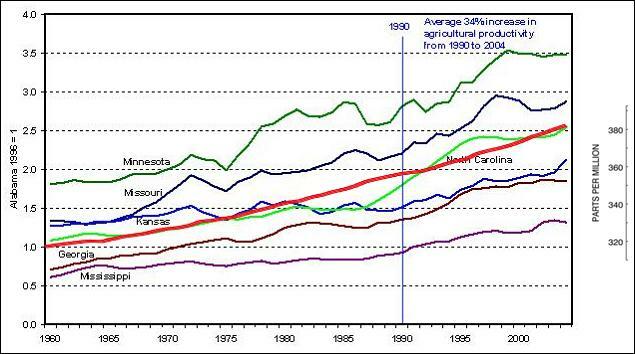 #1: Agricultural productivity is rising due to the rise in CO2, which in turn is holding down the cost of food. That is a life or death concern to the one-third of humanity that subsists on less than $2 a day. Therefore, more CO2 protects life. 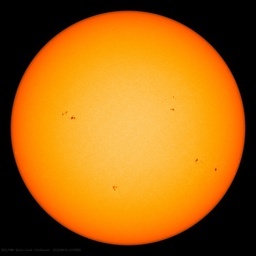 And if the alarmist cult got it’s way and CO2 was reduced to 350 ppm or below, mass malnutrition and starvation would result. But they don’t care; they believe that those are just little brown foreigners who will be affected, and so what? #3: When one side in a debate is 100.0% wrong in every alarming prediction they have ever made, rational people will disregard their current predictions, whether they are about ‘Arctic ice’, or ‘undersea methane bombs’, or ‘man-made global warming’, or anything else. They have been batting .000 and thus they are being booted out of the major leagues. The public no longer believes their false alarms, which are never true. So, Jack Dale, you go and worry about nitrogen, phosphorus and potassium. Plants don’t worry about them because they’re already in the environment. Sure, you can add more to enhance growth. But if you really want to enhance growth, triple or quadruple atmospheric CO2. So, have you got any more juvenile comments? Please show me the peer-reviewed science to support your assertions. An URL or DOI will suffice; a link to co2science will not. Please read the Climategate email dump and you will see how corrupted the peer review/journal system has become. If that ‘Appeal to Authority’ logical fallacy is the best you can do, take my advice above, and go find a science fiction blog. After thoroughly demolishing your juvenile claim that CO2 only produces growth of leaves and stems, etc., you deflected to something else entirely. I don’t blame you. That complete nonsense about CO2 confirms your status as a know-nothing. A three-part Penn State University report cleared scientist Michael Mann of wrongdoing. The National Oceanic and Atmospheric Administration Inspector General’s office concluded there was no evidence of wrongdoing on behalf of their employees. – The person has sufficient expertise in the subject matter in question. – The claim being made by the person is within her area(s) of expertise. – There is an adequate degree of agreement among the other experts in the subject in question. – The person in question is not significantly biased. – The area of expertise is a legitimate area or discipline. – The authority in question must be identified. So you have no scientific evidence to substantiate your assertions. So you haven’t read the Climategate emails. No wonder you’re a know-nothing. The principles who were so-called “exonerated” (heh, they weren’t, and look up ‘Potemkin Village’ some time) were caught bragging in emails about corrupting the climate journal/peer review system. The universities that gave Mann and the rest of the climate charlatans a free pass were collecting tens of millions of dollars due to their rainmakers. Only the most naive and credulous would believe they’re as innocent as Snow White. Those bogus determinations were as ridiculous as the EPA declaring CO2 a “pollutant”. As if. That ties in to your own logical fallacy: the ‘Appeal to Authority’. Contrary to your belief, they’re not authorities at all because they are flatly contradicted by the only Authority that counts: Planet Earth. Global warming stopped many years ago, which debunks the ‘carbon’ scare (FYI, they mean CO2, not really carbon. I’m just trying to fill in your knowledge gaps). Finally, not a single one of the kangaroo courts you referred to allowed any cross examination or hostile witnesses. Not a single one. Every witness called was asked questions that were all kissy-face for the defense, and no one with a lick of sense accepts those stacked deck proceedings as legitimate. They were merely cover for their rainmakers. Obviously you’re not up to speed on the subject, and I’m not interested in schooling you. So I suggest putting a few keywords like ‘Mann”, “investigation”, “climategate”, etc. into the search box here. You will learn far more than you think you know now. I doubt you want to learn, though. You’re too comfortable in your ignorance and prefer to be one of the multitude of mouth breathers, head-nodding along with the nightly newsbabe as she parrots the “climate change” scare. But by all means, prove me wrong. Get up to speed on the topic, so we can discuss it as equals istead of my having to teach you the basics. If a one-time payment of $25,000.00 from a conservative think tank forever corrupts a skeptic” scientist in your mind, how many government-paid “scientists” working for government labs and publishing in government-sponsored (university-purchased) publications using government travel and government grants can the government buy for 92 billion dollars if the government wants 1.3 trillion dollars in new taxes and their banks want 31 trillion dollars in carbon trading? “So, yes, you have no scientific evidence to substantiate your religious faith in CAGW theocracies, other than their (and your?) future profits. And just to show you that isn’t a one-off coincidence, this is solid evidence that more CO2 has been beneficial to the biosphere. In fact, more CO2 is good; there is no known downside. So we have real world observations on one side, and pal reviewed papers written by the same people who have been caught admitting they gamed the climate journal system on the other side. Who should we believe? Planet Earth? Or your corrupt clique of self-serving climate charlatans? I think the ultimate Authority is Planet Earth. But you want readers to believe the Climategate scoundrels. WUWT readers are extremely intelligent for the most part. They can decide if the planet is right, or if your pals are right. But one thing is certain: they can’t both be right. What these comparative 2005/2015 US pollution graphs really show is the destruction of US’ industrial sector and the 10’s of millions industrial jobs that have moved to China…. US businesses waste almost $2 TRILLION/yr in government rules, regulation and mandate compliance costs, with a huge portion from excessive EPA regs that have no real tangible benefits. The solution is to shutdown the unconstitutional EPA and leave it to the individual states to set their own pollution standards. Any state pollution standards should also be based on objective cost/benefit analysis to assure real physical benefits are derived from any set pollution standards. The US should also be replacing all power plants with thorium MSRs as soon as possible as it’s cheaper, cleaner and safer than natural gas/coal and will assure US power independence for 10’s of thousands years. Buster– Under product liability law, if a third party can objectively prove actual physical harm is being inflicted from the perceived excessive pollution from a company in another state, then the court could issue a cease and desist order of the offending comoany in the other state. Prior to the EPA, that’s how these types of issues were handled. Venue for “pollution” violations is complicated, as venue laws vary by state. Again, if REAL damage can be proven, then the courts can work it out. The current EPA overreach must end and the ONLY solution is what I proposed. Regardless, The EPA is an unconstutional entity under the innumerated powers granted to the federal government in Article 1, Section 8. Pollution standards MUST be made by the individual states as granted in Amendmets 9 & 10. All states have enacted product liability laws as they’ve been empowered by the Constitution to do so under Amendments 9 & 10…. Please point out the clause in Article 1, Section 8 of the Constitution where the federal government is granted the power to enact pollution standards…. Before the Constitution, states were imposing protective tariffs on goods from other states. The Commerce Clause was made to address this problem. Nice shredding of the Constitution, there, Buster….Jeez…..
Are you a lawyer for Lois Lerner or Hillary Clinton? This clause 17 only refers to present-day DISTRICT OF COLUMBIA (not exceeding 10 square MILES) where the “SEAT OF GOVERNMENT” resides…. It appears to me that the only increase in air pollution is in China. I wonder if environmentalists will shift their efforts to China. Probably not, China has a very harsh way of discouraging those types of activity. Looks like the major pollution nowadays in US/Europe isn’t from coal, but from automobiles. I can’t wait for President Donald Trump. His plan to achieve energy security for America by exploiting America;s fossil fuel energy reserves will put all this green crap to bed. It will also mean putting the climate science concern back into a box and sealing it for the term of his presidency.